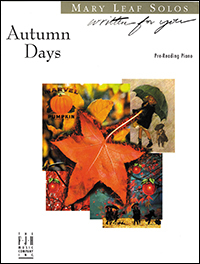 This appealing sheet contains two pre-reading solos in contrasting styles: Colors of Autumn (a minor, black key piece) and Pumpkin Pranks (a major, letter-name solo). Also includes teacher duets. These two pre-reading solos offer a charming peek into the sights and sounds of Scotland. Students will thoroughly enjoy the lively and rhythmic Pipes & Dreams. 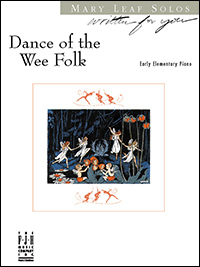 The lyrical and artistic Highlands of Scotland is sure to take their learning to new heights! 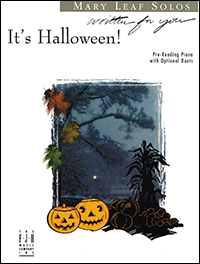 This pre-reading Halloween piece is played on the black keys around Middle C, with the L.H. extending over R.H. to play an additional black key. The lyrics and teacher accompaniment add much mystery to the mood of this piece. This fun, pre-reading sheet includes two piano solos with optional teacher duets. 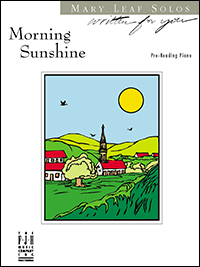 Perfect for the young beginner, these charming pieces feature pre-staff notation and imaginative lyrics. This pre-reading pentatonic solo is played entirely on the black keys,and includes a beautiful, rich teacher accompaniment. 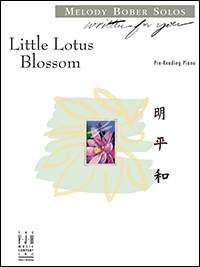 Featuring a charming melody with a Japanese flavor, it will make a wonderful first recital piece for beginning students. This peppy piece features left over right hand crossovers on the black keys. Optional teacher duet adds to the fun. 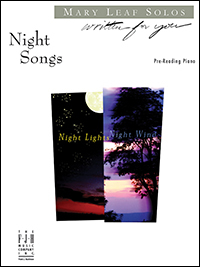 Beautiful and atmospheric, Night Songs presents two pre-reading companion pieces: Night Wind on white keys (A minor), and Night Lights on black keys. These lively pieces are sure to be fall recital favorites. 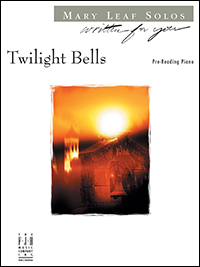 This creative pair of solos, in contrasting styles, offers the beginning pianist an opportunity to experience a wide range of sounds at the Pre-Reading Level. 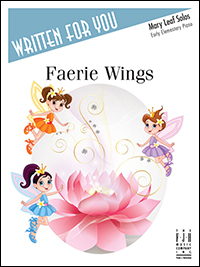 Students and teachers alike will love the imaginative melodies, complemented by clever teacher duets that enhance the imagery of the lyrics. This pre-reading piece utilizes the black keys starting on the D flat just above middle C for the LH, with the RH extending to the E flat an octave above. Written in an ABA form, the B section contains hands-together playing for eight measures. 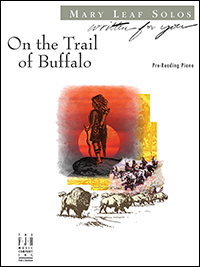 This piece has a good variety of dynamics for your pre-reader to practice dynamic contrast, and contains a teacher accompaniment that contributes to the harmonic support of the student part. 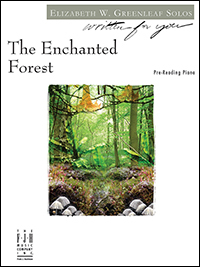 Both teacher and student will enjoy this enchanting piece. This is a delightful pre-reading piece that gives the beginning student a chance to play the LH over the RH on black-key patterns. 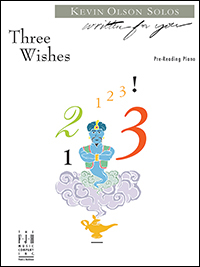 Accompanied by a full and legato teacher part, the pre-reading student will love playing this piece while experiencing movement around the keyboard. Witches on Broomsticks is a pre-reading Halloween piece with the student part written on the black keys centered around Middle C. The lyrics and teacher accompaniment add drama and excitement to this piece. 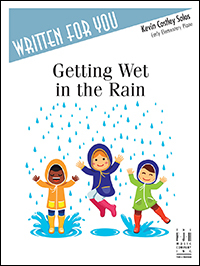 Your pre-reading student will have great fun expressing the "scary" mood by playing the different dynamics and singing along! 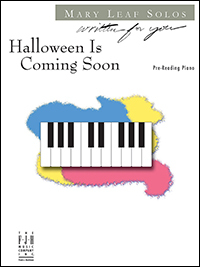 Perfect for Halloween, A Frightful Night presents staccato/legato articulations, a variety of dynamics and 8va playing. Fanciful lyrics and teacher duet highlight this wonderful piece. Young students will have a howling good time! 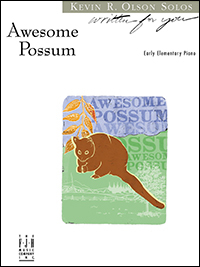 Here's a "totally awesome" blues piece for the hip elementary student! Written in a modified Middle C position with occasional flats, the piece avoids eighth notes and has minimal hands-together playing. With its catchy melody and charming lyrics, Candy Corner is a delightful piece. Written in C major, with a clever left-hand accompaniment, this solo is a sweet treat! 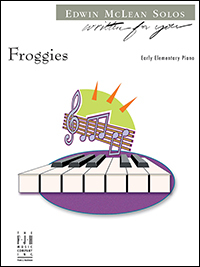 With fun lyrics and a catchy, upbeat rhythm, this entertaining solo will be a joy for students to play again and again. 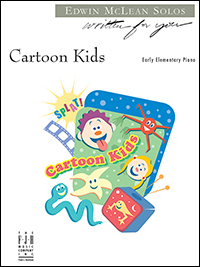 Cartoon Kids will capture the imagination of every child who has watched the make-believe world of cartoons. An early elementary solo consisting of quarter, half, and whole notes, contrasting f and p dynamics, and uses the damper pedal throughout. 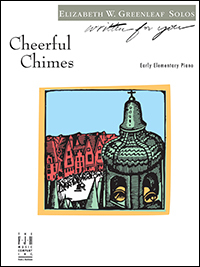 Students get to play one octave higher to realistically create the "chiming" sound effect. 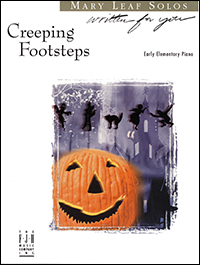 Set in Middle C position, this spooky Halloween piece focuses on soft, staccato playing throughout, with hand positions shifting by the octave. An enchanting solo with optional teacher duet, this "almost Middle C position" piece is in the key of A minor. There are lyrics, but no rests or accidentals. 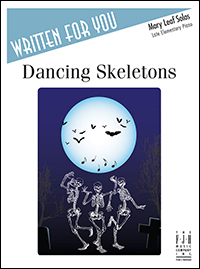 A cheerfully macabre solo with a tempo mark that indicates “with bones rattling”! In A minor, this pedagogical piece with sequential five-finger patterns explores the lower range of the piano with an 8vb. Legato and staccato touches are juxtaposed, and putting hands together is easy. Great teaching material. This could be the first sheet you give your students when they’ve learned Middle C and Bass F. In the key of F (no accidentals used) this easy sheet is enhanced by a beautiful teacher duet and lyrics.